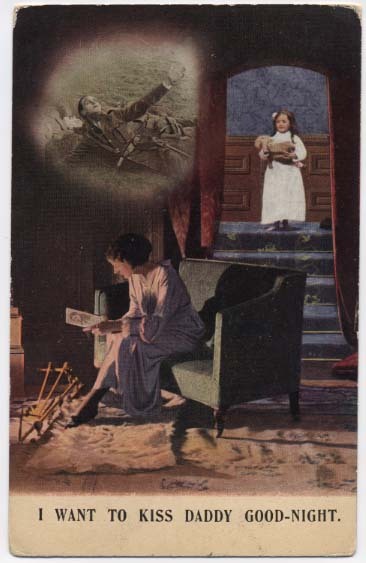 My thanks to Leea Stroia, graduate historian researching WW1, for writing a series of posts based on the John Fraser Collection of Propaganda Postcards, of which this is the first. 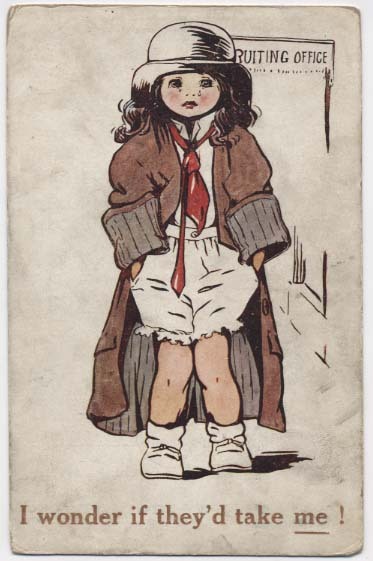 The John Fraser Collection of Propaganda Postcards includes many postcards of children engaged in various activities and filling various roles during the First World War. 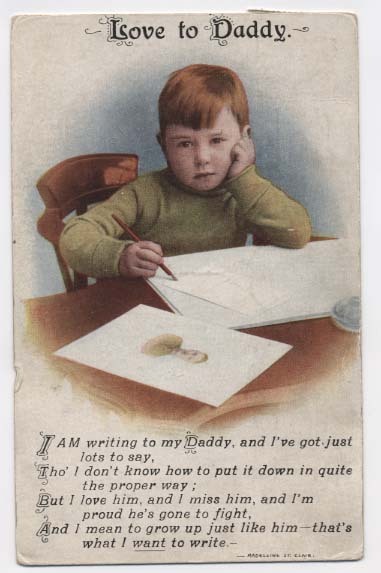 One common depiction of children on the postcards is in relation to adults, notably sons in relation to fathers. This relationship is revealed in three distinct ways. First, boys are shown wishing to be like their fathers and go to war alongside them. 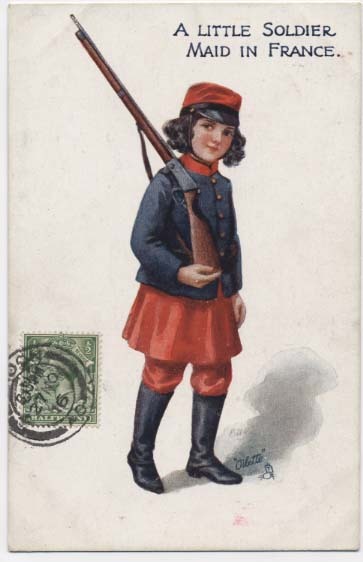 While there are many postcards which encourage recruitment by using children, one way this is often done is through showing boys longing to be like their fathers, to join other men at the front and so to be men as well. This sends the message that manhood is achieved during the war by fighting. Masculinity is appealed to in the recruitment posters depicted on postcards by reminding men that their country asks for them to fight. 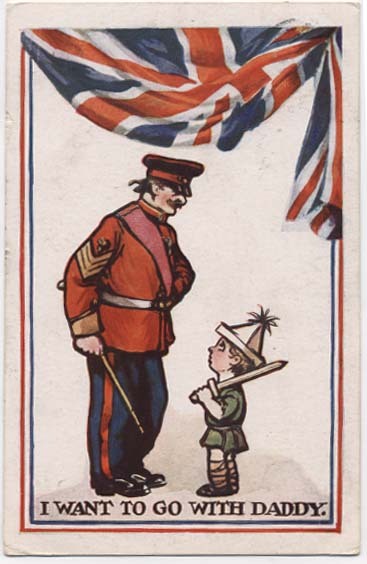 There are many examples of boys looking at the posters with captions such as ‘England shall not ask in vain’. While the postcards highlighted patriotism for its own sake by depicting boys longing to answer their country’s call, they also encouraged patriotism by showing that joining up would lead to recognition. Therefore, one major incentive to joining war according to the postcards was to gain the admiration of one’s sons. 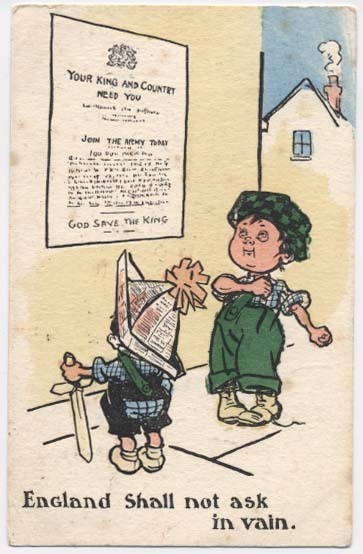 Patriotism and the war effort are advertised in the postcards by showing the zeal of boys who wish they could go to war alongside their fathers. While most show fighting fathers as examples for their sons, there are also several postcards with girls wishing to imitate their father and join up as well. These girls either wish to join and wonder if they can or are simply depicted in uniform. The use of girls longing to fight highlights both the masculine example of soldier fathers but also manipulates men slightly by suggesting that girls may be more manly and so men should prove their masculinity through joining up. Second, boys are shown attempting to fill the empty place that their fathers’ joining up has left. This depiction of absence is done both humorously and seriously. The humorous postcards often depict boys performing tedious tasks, such as buttoning their mother’s many buttons. They depict unattractive or unhappy women with tired boys. The serious ones on the other hand generally have attractive albeit sad women and sad but hopeful boys. 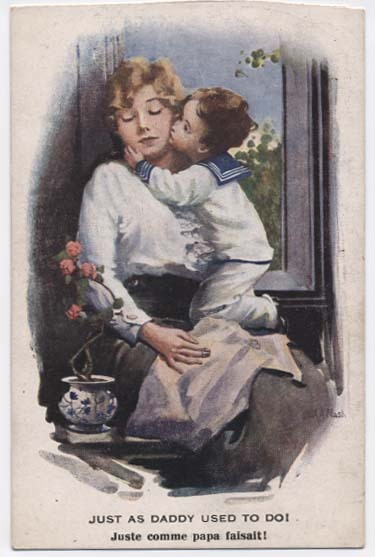 Many postcards show little boys next to their grieving mothers trying to comfort them. The captions make very clear that the boys are trying to be men at home since all the adult, ‘real’ men have gone to fight. They commentate on the illustrations with sentences such as ‘Just as Daddy used to’. Just as boys wished to be like their fathers and go to war, they also wished to fill the void their fathers have left behind and comfort their mothers. Third, boys are shown missing their fathers. The masculinity of the men fighting is only emphasised and solidified by the fact that they are missed by their wives and sons. 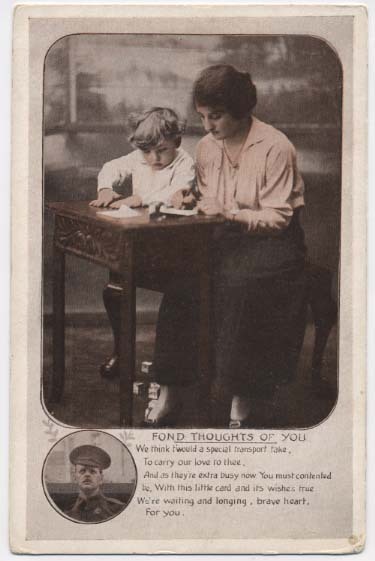 Boys are seen longingly looking into the distance while writing a letter to their father, women and sons write together, and poems on the postcards articulate that the soldiers are remembered and missed. 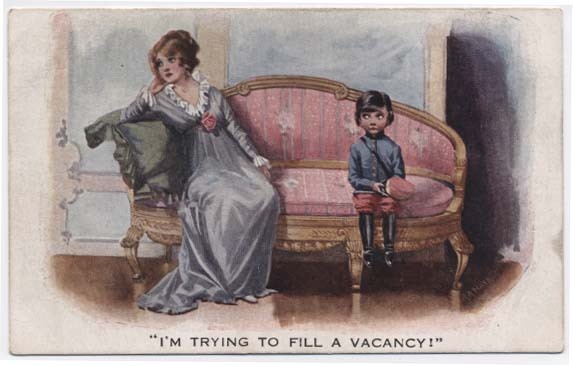 Often these postcards use sentimental photographs rather than cartoons. Some postcards have no images at all and instead have a letter to the father on the front with a space for a personal note on the back. 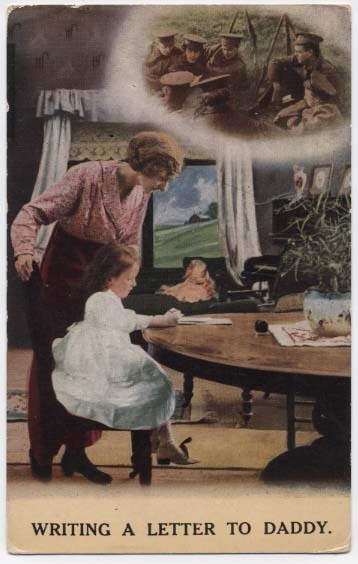 Postcards depicting mothers and daughters are subtly different, emphasising the void left by fathers as girls write to them and wish they could kiss them goodnight. However, these examples also solidify the need for the father’s absence through photographs of soldiers at the Front placed in the corners of the postcards. These different depictions of absence serve to solidify that the soldier is missed and thought of by those at home. All these various cards use the relationships between fathers and sons (and daughters) to highlight the model of masculinity and encourage it. Masculinity during the First World War related to war in propaganda. The true man was also a soldier. The true man was a model for his sons and was missed. The postcards supported and encouraged this patriotic, fighting masculinity by showing soldiers as fathers who were missed, admired, imitated, and loved.